External calendars allow you to subscribe to one or multiple Google calendars to view these in your System One account. A Google calendar can for example contain the private agenda of an artist or an agenda of another agency you are sharing an artist with. The purpose is that with linking these Google calendars to your System One account, you get more information on the availability of artists, as you can see when an artist has a holiday planned, has studio time or has a scheduled booking by another agency. 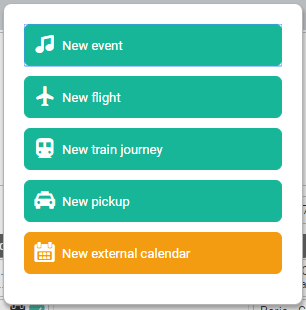 Updates that are made in the Google calendars are automatically updated and reflected within System One. The imported Google calendars are read only and cannot be edited directly within System One. Every 3 hours the Google calendars are refreshed. During the refresh the latest calendar information gets retrieved and updated in System One. The external calendars are visible in he month view, the week view, the year view and in the mobile apps. 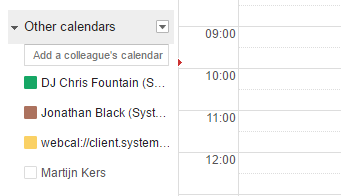 These external Google calendars are indicated with a calendar icon in System One. Go to your Google calendar. With Other Calendars select the option Add by URL. Enter the calendar link in the URL field. You will see that the added calendar will appear in the list under Other calendars. Now go to System One and navigate to your Personal Settings. Select the button Connect to connect your Google account with System One. Select the Google calendar that you want to add from the drop down menu and select Ok.